Flow cytometry. Some people love it—most hate it—but all can agree that it is one of the most powerful analytical tools immunologists possess. Here’s a quick refresher: as the name suggests, flow cytometry measures the physical and chemical characteristics of cells. This is accomplished by fluorescently labeling cell surface markers/proteins using antibodies conjugated to fluorophores. Then both the fluorescent wavelength emission as the cell is passed through a series of lasers and the resulting pattern of light scatter are measured. These data can be analyzed to provide information on a cell’s size, granularity, phenotype, and function. Now that we’re on the same page, how do you get to the point of having interpretable data? That is, once your sample has been ran through your machine of choice (BD Fortessa, BD LSRII, etc. ), how can you distinguish your cells of interest from every other (in your opinion) nonessential cell in your heterogeneous population? Welcome to the Wonderful World of Gating – otherwise known as the most frustrating part of flow cytometry! Not really, but many people think so, primarily due to the subjectiveness of it. Regardless, gating is the most important part of analyzing flow cytometry data. If done incorrectly, you can either be including cells in your analysis that don’t belong or excluding cells that are essential. Either way, you could shoot yourself in the foot. No pressure, though. So what is gating, exactly? According to FlowJo (the go-to flow cytometry analysis program for most of us immunologists) gating refers to the “process of selecting a subset of the collected events for further analysis.” In more simplified terms, when you open your raw data files into a FlowJo workspace and open up a window, each of the little dots plotted represent a cell, which in FlowJo-speak is a “collected event”. By drawing shapes or setting up quadrants (aka gating) to separate these collected events into specific populations, you can begin creating subsets of cells until you have reached the population you are interested in for your studies. Pretty cool, no? How Do I Make a Gate? Several gate tools exist in FlowJo to assist with gating of plots, including rectangle, ellipses, and quadrants (Fig. 1). If none of these tools satisfy what you need, you can always use the polygon tool to make your own shape around the population of interest. Quick tip: when using the polygon tool, rather than taking out a magnifying glass to match up your beginning and ending points, simply double-click your end spot – the line will automatically find your beginning spot and complete your shape. In the instance of examining a histogram, you can use the range tool. Once these gates are set, FlowJo will give you the option of naming the population you just sequestered. I highly recommend renaming it—otherwise FlowJo will default to naming the population based on the fluorescent markers you are comparing in the window, and the name can get mighty long and cumbersome. Where Do I Place My Gates? One incredibly important point in gating is knowing where your positive and negative fluorescence falls on your plots. There are two staining controls widely used in flow cytometry: isotype and FMO. While isotype controls should under no circumstance be considered an actual control (able to discern between positive and negative populations), they are incredibly important for determining the level of non-specific binding of the primary antibodies you are using. Even more important is the concept of FMO, or Fluorescence Minus One. Another article covers FMO in greater detail, but in short FMO allows for you to determine how the fluorophores in a multi-color panel interact and influence the spread of one another (Fig 2). Thus, FMO is essential in correctly identifying positive and negative populations in your plots. Figure 2. Example of FMO. Courtesy of Dart Lab. Once you’ve determined the location of the positive and negative bounds of your fluorophores, separating out the populations in your samples should be pretty straightforward. In the example below, if you’re trying to delineate between CD3+ and CD3- cells, you simply draw a gate around whichever population you’re interested in (Fig. 3A). In this instance, you’re looking at comparing two cell surface markers, such as CD3 and NKG2D, you may decide to use a quadrant tool to separate all 4 population subsets, or a rectangle to single out one grouping (Fig. 3B). It really is all up to you and what you’re studying. Therefore, it’s imperative that you come up with a gating strategy before you begin analysis, or you can get lost in the forest. A gating strategy is simply based on the phenotype of your cells of interest. For instance, I may have the goal of looking at CD45+ cells that are singlets (versus doublets, which means two cells passed in front of the laser at the same time) and alive (versus dead). So, for this scenario, I will put gates around those cells that are singlets, then from this population separate those cells that are singlets and alive, then from that subset I will gate on those cells that are also CD45+. Easy peasy. Figure 3. Delineating immunological cell populations using flow cytometry. A. CD3 positive and negative populations. B. 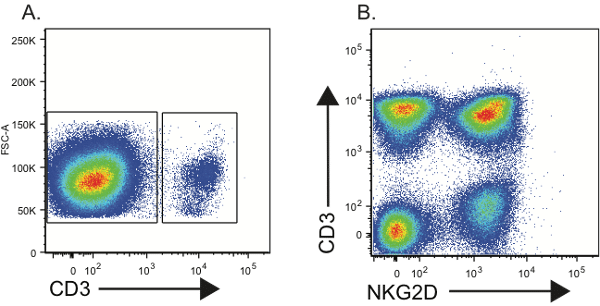 Comparing cell populations expressing different levels of CD3 and NKG2D. Why Does This Still Seem So Difficult? Plain and simple: subjectiveness. Due to the plasticity of cells, how they respond to conditions and treatments, types of fluorescent markers used, PMT voltages used in acquiring the sample, and so many other parameters, there is no set gate placement that can be reliably applied to all data all of the time. So even when you are as consistent as humanly possible with your samples and subsequent analysis, you will likely still see variability in the layout of populations in your plots. While you can control for many aspects of this discontinuity, many times you have to go with your gut when deciding the ultimate placement of a gate. Easier said than done, given the natural bias for data analysis we have as humans. But rest easy: practice makes perfect. So, the more comfortable you become with flow cytometry, the easier it will be for you to determine the correct gate boundary for your populations of interest. I promise. If this article peaked your interest about flow cytometry and how to master it, there are several articles right here on Bitesize Bio that go into more detail on different aspects of the technology (just search “flow cytometry” in the search bar). We will also be continuing our exploration of flow cytometry with future articles, so feel free to comment on what you would like to learn more about! Robertson, S. (2014) News Medical. What is Flow Cytometry?